Why are our nuts the best? We carefully select our nuts so you carefully so that you receive only the very best... For nut lovers and experts the following makes them special... The pecans are goergian and are all whole pieces (hardly any broken ones). The almonds are all roasted in small batches. The pistachios are the largest the 18/20 per ounce. The cashews to are also very large with 240 pieces per pound. The macadamias are hawaiien grade #1. The peanuts are verginian. The walnuts are all full halves and the jordan almonds are grade super fine with many more per pound than the average jordan almond. We guarantee that anyone that buys or receives this gourmet selected gift box will love it and appreciate it. 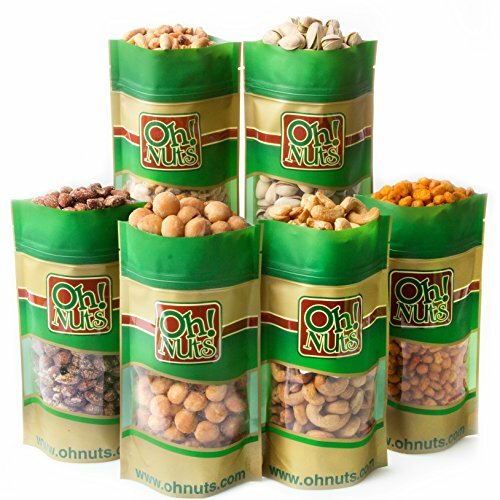 A great gourmet selection of assorted nuts includes our tasters top picks. The gift box includes Flavored Roasted Jordan Almonds, BBQ Cornnuts, Chefs Grill peanuts, Salted Pistachios, Salted Macadamia, Raw Brazil Nuts, Hickory Smoked Almonds, Honey Glazed Peacans and salted cashews. We have carefully selected the varieties for this unique gift box so it includes a favorite for everyone. Great as a gift basket for holidays or any other occasion.